New Orleans chef Donald Link (Herbsaint, Cochon) came to town last month to see what was happening in the Seattle food scene and film a few segments for his webcast Taste of Place on the Delish Channel. 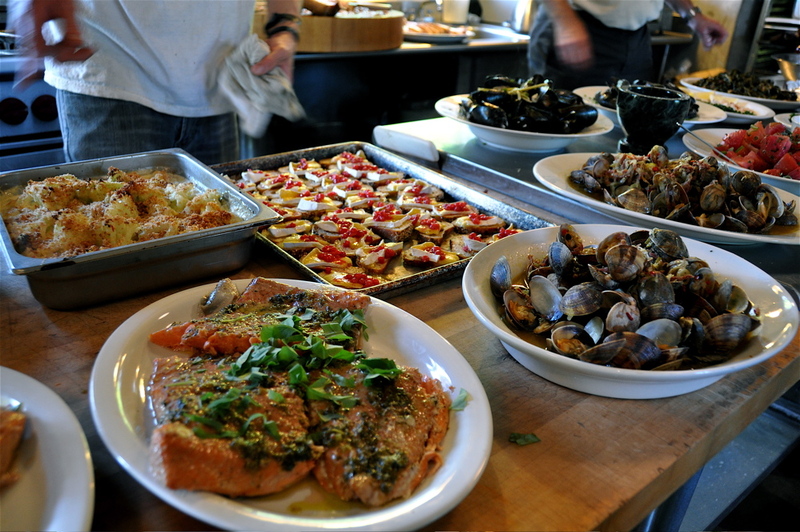 The chef wanted to spend a day foraging while he was here. 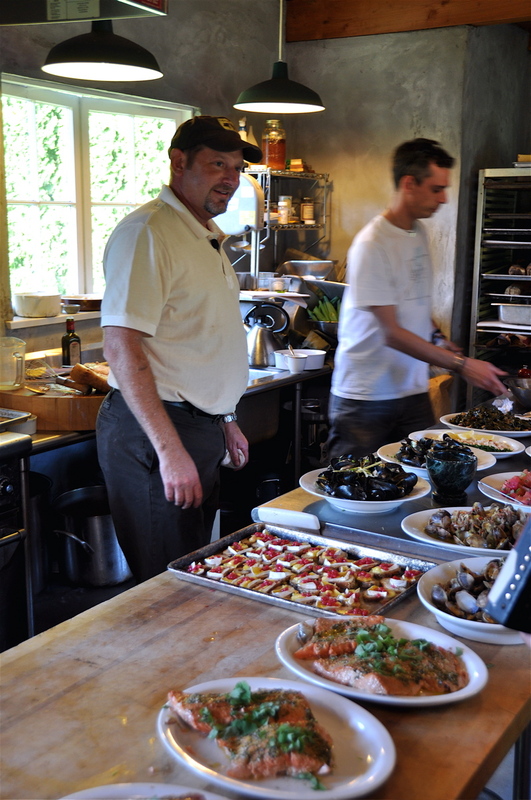 Mid-July is actually an in-between time for the Northwest forager. Many of the spring greens have gone to seed and most berries are not yet ripe. There is one berry, though, that begins to ripen in early July, the first of the many species of huckleberry native to the Pacific Northwest: Vaccinium parvifolium, the red huckleberry. With this in mind, I brought Donald to the huckleberry patch to forage some berries for the dinner he would cook later that week at Kurtwood Farms. There are 13 varieties of huckleberry in Washington State. All are edible, and I've never found one that wasn't delicious. Some are tart, some are sweet. 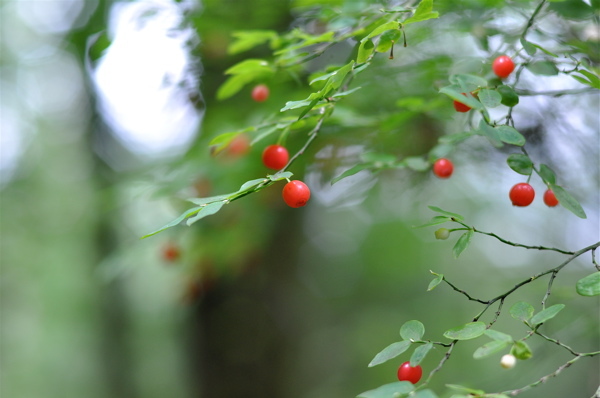 Some, like the red huckleberry, are early fruiters, while others, like the evergreen huckleberry, fruit late into fall. This is why it's good to know many different species of huckleberry: you can find them in different habitats at different times of year. Red huckleberries are found in low-elevation mixed forests, most commonly on the West Coast from California to Alaska, though they can be found as far east as Idaho. Picking huckleberries is an exercise in carpal tunnel syndrome but it's worth remembering that a little can go a long way, especially with red hucks. They have a beautiful, almost unworldly red hue, and a very distinctive taste. Donald would make expert use of these two qualities—the color and flavor—by adding them sparingly to an appetizer and a dessert. 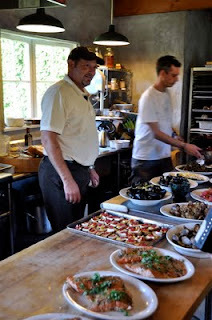 By the time I arrived at Kurtwood Farms on Vashon Island, Donald had already put in a full day harvesting fresh vegetables, breaking down a pig, and sampling cheeses with owner (and author) Kurt Timmermeister. He even got to play with a geoduck. 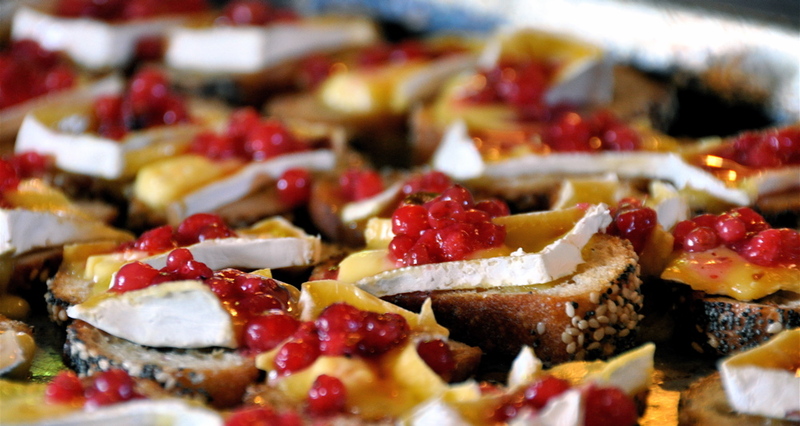 Donald used the red hucks to top a crostini of melted camembert (click here for video recipe) and with Kurt's raspberries in an egg custard. Wiping the sweat from his brow, he looked at the camera and said, "Cooking is my vacation." I believed him. To watch the entire 6-minute webisode of Chef Donald Link's visit to Seattle, click here. 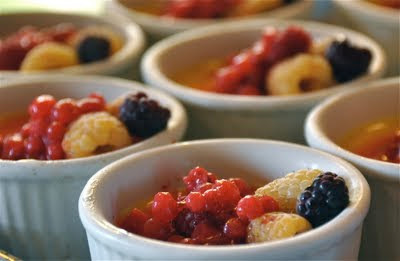 Thanks for sharing, I learned much about huckleberries thanks to you. I have a soft spot for the red huckleberry because we used to pick them in old clearcuts when I was kid at Hidden Valley Camp, back when Granite Falls was WAYYYYY out in the boonies. There was even a "Huckleberry Hill." I didn't know huckleberries were anything but red until years later. We'd take the old big coffee tins, fill them up, and take them to the camp cook. I recall the most amazing fresh huckleberry pie that she concocted. Food memory is strong! She topped the delicate crust with a sweep of sparkly sugar, oh my was it delicious. Thanks for the memories. BTW, congrats on all your press, saw you in Sunset. I'm blogging away in obscurity but honestly I do it because I love doing it. period. Keeps me writing and seeking "blogworthy" experiences. Neil - Red huckleberries are still out there, and mountain huckleberries are just hitting their stride. Go get some. Jill - No way! My son went to Hidden Valley Camp for the second summer in a row this year. He came home singing the huckleberry song and talked about picking berries up on Huckleberry Hill. Granite Falls isn't quite so far out in the boonies as it used to be, but it ain't the city either. Thanks for sharing your huck memories and good luck with the blog. Ha! That's cool about your son gong to HVC, and wow can't believe they are still picking the berries on Huckleberry Hill! Thanks.